Astronauts had to swim before they could walk. 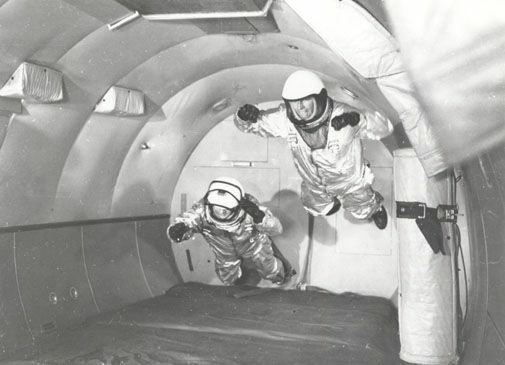 “Watching the Gemini 9 EVA from Mission Control convinced me that I’d better be well prepared for the space walks I was to perform on the Gemini 12,” Buzz Aldrin wrote in his 1989 memoir, Men From Earth. “I had a lot of respect for Gene [Cernan] and thought he could have done better had he had different training. In fact, after Gemini 9, Gene joined me in a series of underwater training sessions in a pool near Baltimore to prepare for the Gemini 12 mission. (He was on our backup crew.) I was an experienced scuba diver before beginning this ‘neutral buoyancy’ training. 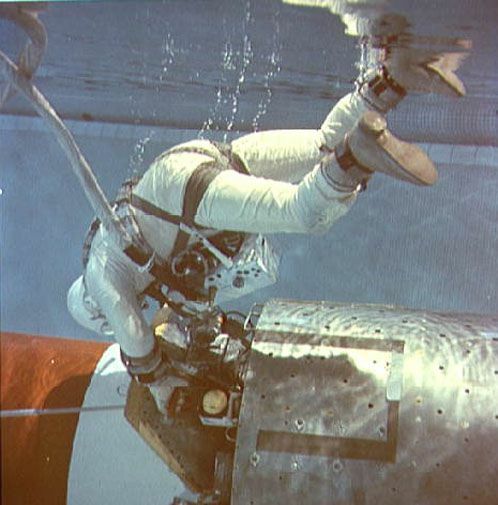 It seemed to me that practicing underwater was better preparation for an astronaut’s weightless EVA than with the wire-and-pulley training gadgets that came and went in Houston, but never really worked. Here, astronaut Buzz Aldrin carries out underwater training in October 1966 at the McDonough School For Boys in Baltimore. The pool contained a full-size mockup of Gemini’s equipment section.